With boruto getting a dojutsu with the potential to be something close to the rinnegan, i only thought it was fitting for me to clear a lot of the misconceptions about the rinnegan. The rinnegan first appears in Hagoromo not Kaguya his mother (her own dojutsu is the rinnesharingan). He is not born with it as his brother Hamura was born with the byakugan (the original dojutsu of the otsutsuki clan), he isn't born with any dojutsu. He was born with very powerful chakra which gives him the ability to perform feats without handseals. He awakens the sharingan after a personal tragedy. He learns sage mode from the toads of Mount Myoboku and combined with his chakra gives him access to a very strong form of sage mode known as "6 paths sage mode". He awakens the Mangekyo Sharingan after a battle with his brother Hamura which then turns into the rinnegan almost immediately. My theory is that the mangekyo sharingan when combined with the 6 paths sage mode or the body of a true sage turns into a rinnegan. Lets take a look at the others who unlocked the rinnegan. Madara Uchiha who was a reincarnate of Indra awakened the Mangekyo Sharingan and with the use of his brother's Eye turn it into the Eternal Mangekyo Sharingan was only able to awaken the rinnegan after stealing and grafting a piece of Hashirama Senju's flesh unto his wound to enable it heal. It was many years afterwards that he was able to awaken the rinnegan and it could be that the chakra in the flesh wasn't sufficient or enough to awaken the rinnegan immediately and thats why that period of time was passed before the rinnegan was awaken. Sasuke Uchiha who is also a reincarnate of Indra awakened the rinnegan (i believe an incomplete one) only after meeting Hagoromo and the latter sharing some of his power with Sasuke. I would discuss Sasuke's rinnegan in an upcoming article. I believe reincarnates of Ashura such as Naruto and Hashirama can also awaken the rinnegan. 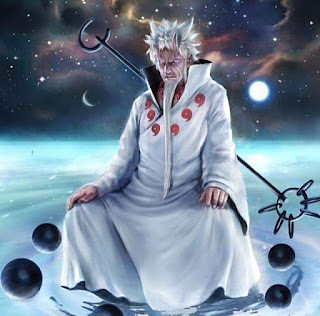 If the situation was reversed and it was Madara's EMS that was stolen by Hashirama and put into his eyes, due to the mechanics of combining Indra and Ashura's chakra, the rinnegan would be awoken by Hashirama who would in turn have access not only to the rinnegan abilities but to the abilities of the Sharingan just as Madara had access to wood release when he inserted Hashirama DNA into himself. This article only discusses the way the rinnegan can be awaken, the next article would discuss about the abilities available to it after it has been unlocked or transplanted into another individual.